The story of the day in the men’s race was the redemptive return of winner Ben Hoffmann. 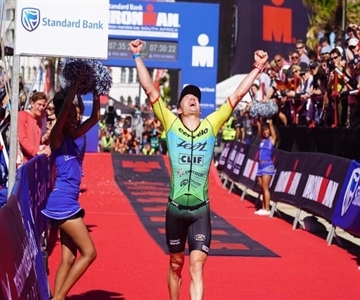 After winning the Standard Bank IRONMAN African Championship back to back in 2016 and 2017, he faced one of the hardest moments of his career at last year’s race in Port Elizabeth, South Africa. "The Hoff" was injured and had to walk the majority of marathon. Then, he was forced to sit out the rest of the racing season as he rehabbed back to health. After a one-year absence from IRONMAN racing, Hoffman proved this past weekend that he's back in a big way. "After last year, I came here with real fire in my belly," said the 35-year old. "I knew, I had a good preparation. I felt like coming home again and I wanted to show a great performance." Hoffman was consistent all day long—he had a solid start on the 1.6K swim course (shortened due to safety concerns), and came out of the water only a minute behind the field-best swimmer Josh Amberger. The American paced himself smartly on the bike, even when Germany’s uberbiker Andreas Dreitz appeared at the front and pushed the pace. Everyone was waiting for Dreitz to make his move, but it was Hoffman who did so in the final 20 kilometers. "I went out there and attacked the race," said Hoffman. "After one year without IRONMAN I was full of hunger." His marathon performance was phenomenal (2:39:17). Or as Hoffman said later, "When my body said 'no' today, I said 'yes.'" In second place, Germany’s Nils Frommhold also showed a strong comeback after a year full of injuries. Michael Weiss of Austria rounded out the men’s podium with his stellar run. In the women’s race, all eyes were on defending champion Lucy Charles-Barclay. The 25-year-old two-time IRONMAN World Championship runner-up was expected to swim away from the field, then hammer on the bike. Due to the shortened swim course, the gaps were smaller, and only Lauren Brandon (USA) could stay on her heels, while Germany’s Anja Ippach was more than four minutes down after the swim. Ippach pushed hard on the bike to open up a gap of a little more than three minutes on Charles-Barclay and Brandon, but this advantage disappeared quickly on the run. The defending champ took control after about 8K and carried her lead to the finish line. "It was really tough out there," said Charles-Barclay, "but on the run I felt better and better." A storming Gurutze Frades (ESP) finished second, while South African Annah Watkinson, was third. Revisit the 2019 race coverage here.